Photo of the path down to the baths, around 1965. The hot springs made it possible. The steamy tubs provided the chance encounter between the lead thinkers of mid-20th-Century America and their sensory, bodily experience. They wanted more, and what is today known as Esalen massage grew out of this impulse. The steep path down to the springs hugging the edge of the cliff, the sea below, and the brilliant starry night all played into the myth-like entry into the bathhouse. Hot steamy tubs smelling of sulfur lured the bather toward reported health benefits. Once in, the bather “floated” in the heavy, slippery water, arms bobbing up, skin flushed, and state of mind shifted, grown dreamy. While seminarians came to attend weighty workshops led by Alan Watts and other deep thinkers up in the lodge, down the hill lay a more earthy dimension. This novel experience brought them back to Esalen for longer visits, back to their bodies, back to a deeper universal connection with the sun and the moon and the sea and their own skin. Back to a felt experience that made sense out of the talk up the hill. Massage at Esalen initially matched the quick sessions offered by early 20th century California hot springs resorts, a variant of Swedish massage with its emphasis on circulation and strong therapeutic stance. The local staff began to improvise, and as early practitioner and dancer Storm so succinctly put it, “in the beginning, none of us knew.” They quickly improvised. The ocean waves evoked a slower, more fluid pacing, as did Gia-Fu Feng’s daily t’ai chi class. The dark massage rooms were lit only with candles, lending a sense of ritual enhanced by the staff’s flowing hair, occasional song, and pauses for energetic connection. Molly Schackman had come to Esalen to offer Swedish Massage Sessions. Bernie Gunther, Charlotte Selver’s most infamous student, offered her sensory awareness experiments, using exercises such as slowly lifting and very slowly lowering the receiver’s head or legs, holding the hand and sensing the contact, lightly tapping the head. Feeling good became part of the therapy. As Esalen gained renown for its new and unique voice on the American soundscape, the culture also went through a sea-change, led by the currents of enfranchisement for blacks and women, new pharmacology, and an affluence that could afford some self-examination. Young people followed Alpert and Leary’s suggestion to drop out to drop back in again later. The Esalen staff filled with young sojourners, well-educated hitchhikers and van dwellers who sought something more than the full belly and flat culture of their parents’ homes. Some stayed on at the Institute, offering massages to the growing number of guests, most of whom had never even considered lying on a massage table before. The work became the teacher. The massage crew, with me onboard, soon learned the immense possibilities of bodywork to release lifelong wounds, free up inhibiting muscles, and take clients to new psychic realms. We witnessed extraordinary change on a daily basis as we introduced massage to workshop participants from Kansas and England and Switzerland, and aided in our clients’ reunions with their bodies. Certainly we were not the first—there were older traditions of body-mind-spirit in California—but we were the ones on the frontier reaching the broader audience. If the client experienced a transformational moment on our table, we let the session take its course, which meant that the time schedule was often skewed in the interests of personal growth. Esalen’s spreading reputation soon brought the leading bodywork teachers in the world—Ida Rolf, Moshe Feldenkrais, Randolph Stone, and later Milton Trager, as well as many top gestalt psychiatrists/psychologists turned Rolfers. Each brought a particular model, and we began to broaden our concept of what massage was. We learned about fascia and the nervous system. We learned about energy. We learned about process. It is particularly interesting, for example, to look at George Downing’s 1972 The Massage Book. He details how to build your table, how to complete your long strokes, how to sense your partner. He doesn’t address depth, nor does he have much to say about stretches or movement within the session, or how an individual might be structured. He focuses on the connection, and briefly on the methodology. Still current and well regarded, that book was listed by National Health magazine as the first of twenty-five best books that have changed our thinking about our health and our world. Today’s massage teaching and practice continues to flourish and evolve under the increasing interactions with touching practices from various corners of the world. 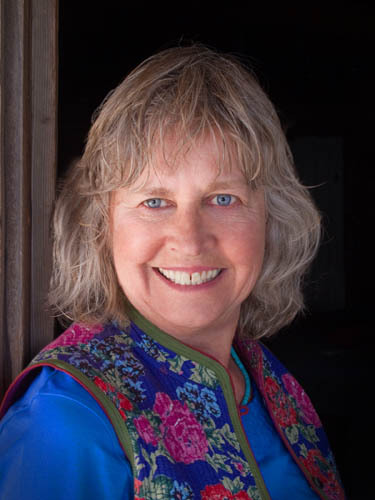 Brita Ostrom, at Esalen since Fritz Perls' birthday in 1967, directs the Esalen Massage School, is a student advisor, as well as an international workshop leader for massage and somatic workshops.